Akshat’s hand burns as coal as the Pandit ji hands him the sweet of Prasad. Niyati observes his pain and prays for God’s help in discovering the roots of Akshat’s Tantra. Akshat and Niyati come to meet Kanchan who waited at the other side of the bar. She smiles watching them come in. She tells Niyati she bears the punishment of intervening in their matters. Akshat shouldn’t as well believe he can get rid of this. No one can discover about their Tantra. Akshat says this is enough, she won’t be able to harm him anymore. Kanchan reminds what Akshat had done upon her tips, he took life of that girl who had nothing to do with all this. She says further, Akshat will have to finish off Khanna family. He will kill his beloved wife in the end; and in front of everyone. Akshat clutches Kanchan’s neck and warns he can’t let her win this time. Kanchan clutches his amulet and tries to pull it. Niyati holds Kanchan’s hand tightly and was able to protect the amulet from her grip. Kanchan was pushed back and fells on the floor. A police inspector comes in. Kanchan complains that Niyati tried to harm her. Back at home, Akshat says Niyati shouldn’t have pushed Kanchan. They won’t get permission to meet her again. Niyati says it was important to save his amulet. Akshat apologizes Niyati. Niyati says they need to be extra careful at home now. Both turns to go inside but Sumati stops them there. Sumati tells Niyati and Akshat she heard they were talking to hide something, and there were some differences. Niyati explains they fight a lot, and were discussing they shouldn’t do so. Sumati says they had gone to farm house for a week, the caretaker said they left separately in a single day. What’s the truth? Before Akshat could speak, Niyati holds his hand. She says she had to go to Choti Ghaati temple, Akshat was unwell and she didn’t wake him up. When he woke up he was annoyed, then called her to stay on highway. All the problem occurred when they met. Sumati inquires what had happened to Akshat. Akshat says he had head ache and his eyes reddened. Sumati confirms if this is the real truth, or are they lying. Niyati thinks she can’t tell her the whole truth, but didn’t lie to her completely as well. Ashutosh calls them inside, as Prithvi has to speak to them. Prithvi gives the news to everyone that their hotel with an English family is complete. They will leave for inauguration by road. Parth and Kartik were excited for long drive and hiking. Prithvi asks them to get ready and make the packings as well. Sumati notices Niyati’s phone was ringing, it was Dr. Drusht. Niyati goes inside for packing. Akshat follows Niyati to the room. Sumati thinks she must find out what is Niyati hiding. PRECAP: Dr. Duksh gives Niyati a bag to protect her from Kanchan’s hurdles. Niyati comes out of Jalsa with the bag and was attacked by a cloud of bats. 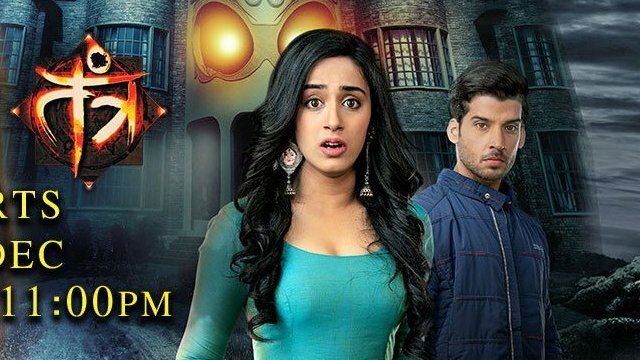 The post Tantra 1st March 2019 Written Episode Update: Niyati and Akshat’s resolve against Tantra appeared first on Telly Updates.